The Hurricane Mk II entered service in 1940. Compared to the early fighter variants, it was equipped with a more powerful engine, and its armament was gradually enhanced. This modification remained in production until 1944 and was also built in Canada. Top armament of four hispanos will gradually chop down anything they get their teeth into, and have good range. Can mount the most machine guns on a plane in the game: at a whopping six on each wing. 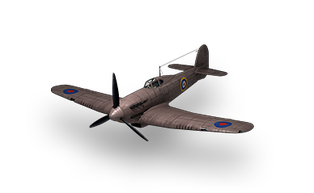 The Mark II Hurricane is a flying grizzly bear: Slow, a little cumbersome, but leaves a nasty mess of anything it can get its claws on. Pilots will have two options for gun armament once fully upgraded: A jaw dropping twelve machine guns, or four hispanos. The hispanos have better range, and deal more damage per shot, while the twelve machine guns take longer to overheat and are better for when the Mark II gets caught in a winding dogfight. The pilot may take their pick. With the Hispanos, pick off anything that gets in front of you as quick as you can, if it is a ground attack craft, the hispanos will maul them if managed properly. This page was last modified on 7 July 2018, at 16:59.